The Mint of Finland has announced the launch of a new series of coins dedicated to the nation’s presidency and to the men and women who have occupied the position. Since Finland’s independence in 1917, there have been a total of twelve serving presidents who until 1994 were elected by parliamentary referendum rather than a popular vote by the electorate. Finland’s independence was the direct result of the political instability of the Russian Empire during World War I. Finland had held the status of a Duchy within the Russian Empire since 1809, but with the abdication of the Russian Crown by the Czar in 1917 Finland was now without its foreign ruler and sought its independence. After the collapse of the Russian dominated government, a civil war erupted between supporters of the Socialist movement in the emerging Soviet Union and conservatives who favored closer ties with Imperial Germany. Finland’s history and government might have looked very different today had it not been for the defeat of Imperial Germany in 1918. The provisional government elected a German Prince to head a new Finnish Kingdom; Prince Frederick Charles of Hesse was elected as King of Finland on October 7, 1918. With the imminent defeat of Imperial German forces, he never took office and renounced the throne on December 4 of that year. Rumor has it that Prince Frederick chose as his regnal name Väinö I of Finland, which may have referred to Väinämöinen, one of the main characters in the Finnish national epic, the Kalevala. Surviving records have not been able to prove this, however. After this brief flirtation with a monarchical form of government, a Republic emerged. Its first president was Kaarlo Juho Ståhlberg (1865–1952), a Finnish jurist and academic who is also remembered for playing a central role in drafting Finland’s formal Constitution in 1919. He was elected head of state by parliament on July 25 and served in that capacity until March of 1925. 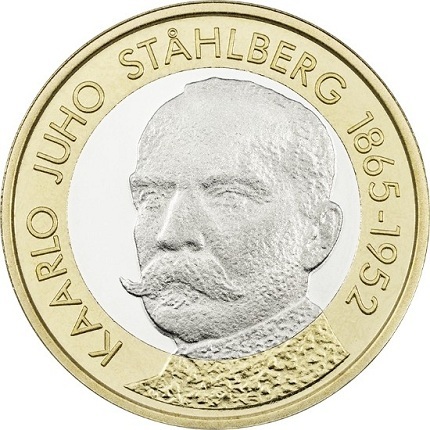 The new coins are designed by Tero Lounas. The first issue portrays President Ståhlberg in a three quarter front-facing image, along with his name, year of birth, and year of death placed along the edge and around the portrait. 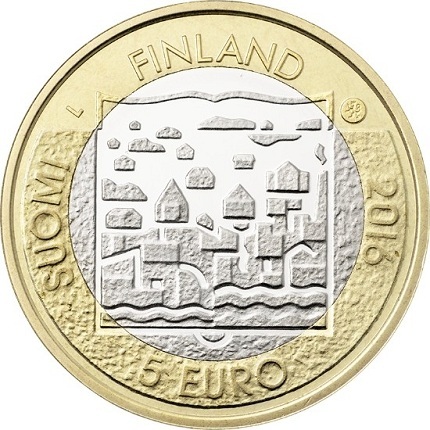 The reverse depicts a landscape of Finnish fields, framing an open book on which is depicted a constructed urban environment. 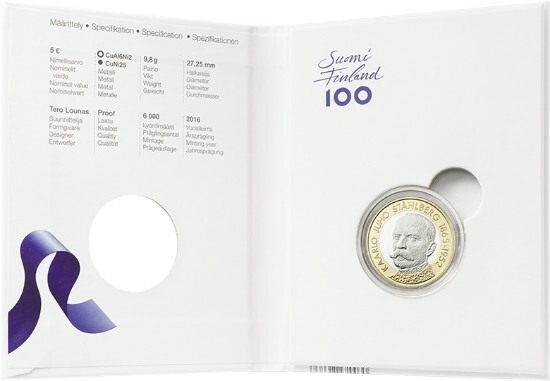 The collector coins in the “Presidents of Finland” series will feature in the Finland 100 program, which will celebrate the centennial of Finland’s independence in 2016 – 2017. A total of eight collector coins are planned for release in the series, with additional issues featuring L.K. Relander, P.E. Svinhufvud, and Kyösti Kallio planned for release in 2016. Coins with Risto Ryti, C.G.E. Mannerheim, J.K. Paasikivi, and U.K. Kekkonen are planned for 2017. All coins in the series will share the same reverse. For more information on this and other coins offered by the Mint of Finland, please visit their Web site. International orders will be dispatched where applicable.